Introduction We developed and validated a new parsimonious scale to measure stoic beliefs. Key domains of stoicism are imperviousness to strong emotions, indifference to death, taciturnity and self-sufficiency. In the context of illness and disease, a personal ideology of stoicism may create an internal resistance to objective needs, which can lead to negative consequences. Stoicism has been linked to help-seeking delays, inadequate pain treatment, caregiver strain and suicide after economic stress. Methods During 2013–2014, 390 adults aged 18+ years completed a brief anonymous paper questionnaire containing the preliminary 24-item Pathak-Wieten Stoicism Ideology Scale (PW-SIS). Confirmatory factor analysis (CFA) was used to test an a priori multidomain theoretical model. Content validity and response distributions were examined. Sociodemographic predictors of strong endorsement of stoicism were explored with logistic regression. Results The final PW-SIS contains four conceptual domains and 12 items. CFA showed very good model fit: root mean square error of approximation (RMSEA)=0.05 (95% CI 0.04 to 0.07), goodness-of-fit index=0.96 and Tucker-Lewis Index=0.93. Cronbach’s alpha was 0.78 and ranged from 0.64 to 0.71 for the subscales. Content validity analysis showed a statistically significant trend, with respondents who reported trying to be a stoic ‘all of the time’ having the highest PW-SIS scores. Men were over two times as likely as women to fall into the top quartile of responses (OR=2.30, 95% CI 1.44 to 3.68, P<0.001). ORs showing stronger endorsement of stoicism by Hispanics, Blacks and biracial persons were not statistically significant. Discussion The PW-SIS is a valid and theoretically coherent scale which is brief and practical for integration into a wide range of health behaviour and outcomes research studies. The Pathak-Wieten Stoicism Ideology Scale (PW-SIS) is a new, theoretically coherent, multidimensional scale which measures stoic beliefs and sense of self along four domains: stoic taciturnity, stoic endurance, stoic serenity and stoic death indifference. The PW-SIS contains 12 items and demonstrates good psychometric properties and content validity in a large sample (n=390) of educated adults. Mean stoicism ideology scores were higher for men than women, but for both genders the most frequent scores were neutral on stoic ideology, and the response distributions by gender overlapped almost completely. Further validation of the PW-SIS in demographically and socioeconomically diverse populations will improve its generalisability. Stoicism is a school of philosophy which originated in ancient Greece.1–3 Core elements in the classical definition of stoicism were an idealisation of imperviousness to strong emotions, and an indifference to death.3 Major Asian philosophical systems of thought, such as Buddhism and Confucianism, also endorsed stoic principles and teachings.4 5 Beginning in the 19th century, academic and popular philosophers in Europe and the Americas were exposed to and influenced by Asian philosophy and religion. Therefore, it may not always be possible to distinguish whether particular strands of contemporary thought associated with stoicism originated in ancient Greece, ancient India or elsewhere. For example, using very different language and symbolism, both the Greek Stoics and the Buddha exhorted the student to live fully and completely in the present, while minimising concern about the future. Direct measurement of stoicism in previous health-related measures has implicitly defined stoicism as a pattern of behaviours, not as an ideology. The pain attitudes questionnaire (PAQ), published in 2001, has a brief subset of questions focused on stoic responses to physical pain.20–22 The stoicism items in this scale were designed to capture pain coping strategies of chronically ill or injured patients. Of the 29 items in the PAQ, most measured past actions (ie, pattern of behaviour) and only 2 were explicitly focused on ideology: #2 ‘When I am in pain I should keep it to myself,’ and #24 ‘Pain is something that should be ignored.’ The 20-item Liverpool Stoicism Scale (LSS) was first developed in 19923 and has not been widely used.24–27 The LSS predominantly (16 of 20 items) assesses a single theoretical domain (stoic taciturnity) of the four validated theoretical domains included in the final Pathak-Wieten Stoicism Ideology Scale (PW-SIS) (table 1). In 1983, Kathy Charmaz published a very influential sociological study on the ‘loss of self’ suffered by people with chronic illnesses.28 Although stoicism per se was mentioned only briefly, the idea that the suffering caused by disease emerges as much (or more) from threats to a person’s identity and sense of self as from purely bodily experiences of pathophysiology is one of the theoretical underpinnings of our work. In this report, we attempt to articulate an explicit theory of stoicism and its potential impact on health. We theorise that stoicism is a system for self-regulation rather than a behaviour or personality trait. As a guide to ideal self-conduct, it requires self-conscious implementation and regular enforcement; in other words, stoicism is an ideology (eg, a belief system which informs one’s attitudes and actions with the inherent potential for internal resistance and conflict). Personal ideologies create expectations for people about who they are, as well as how they should and should not behave. For example, we theorise that people who strongly endorse a personal ideology of stoicism may be more likely to avoid or delay seeking professional medical intervention for serious signs and symptoms of disease. This personal ideology of self will not mandate behaviour in a deterministic fashion; rather, stoicism will create expectations of ideal behaviour (which may not always be met). In order to test these theoretical propositions in future research, a validated measure of an individual’s endorsement of stoic ideologies is needed. The purpose of our study was to develop a theoretically coherent multidimensional scale to assess endorsement of a personal ideology of stoicism, and to empirically validate this scale in a multiethnic sample of healthy community-dwelling adults. We present the results of confirmatory factor analysis (CFA) of the multidomain PW-SIS, and discuss the potential usefulness of this tool for predicting constraints in health-related help-seeking behaviours. The PW-SIS is a generalised scale which assesses stoic beliefs and sense of self but does not explicitly measure health behaviours or health outcomes. Therefore, the PW-SIS can be used in a wide range of empirical research studies. In addition, in this report we conducted an exploratory assessment of the association between high endorsement of stoicism and participant age, gender, and race and ethnicity. We expect stoic ideologies to be embedded in a larger system of cultural beliefs that may be related to age, gender, race and ethnicity, and other social characteristics. Stoic taciturnity is the belief that one should conceal one’s problems and emotions from others. Stoic endurance is the belief that one should endure physical suffering without complaining. Stoic composure is the belief that one should control one’s emotions and behaviour under stress. Stoic serenity is the belief that one should refrain from experiencing strong emotions. Stoic death indifference is the belief that one should not fear or avoid death. Each item in our scale was carefully worded to capture the respondents’ ideology, not their past behaviour, using a 5-point Likert response scale with the following responses: ‘disagree’, ‘somewhat disagree’, ‘not sure’, ‘somewhat agree’ and ‘agree’. Nine of the original 24 items were ‘reverse’ items that specified antistoic beliefs, that is, ‘I believe I should experience strong emotions.’ The participant version of the scale (pen-and-paper questionnaire) listed response codes of 0 (disagree) through 4 (agree). These responses were recoded during analysis to range from −2 (disagree) to +2 (agree). Consequently, an average score of 0 corresponds to a neutral stance—neither endorsement nor rejection of stoicism. Positive scores indicate endorsement of a stoic ideology, while negative scores indicate rejection of a stoic ideology. Data were collected over a period of 10 months during 2013–2014. All participants were university employees or students. Written consent forms were waived by the IRB to ensure respondent anonymity but all participants provided verbal informed consent. Each participant completed a brief paper-and-pencil questionnaire consisting of the 24-item preliminary PW-SIS, sociodemographic questions and a final single item ‘I try to be a stoic’ with a 7-item response scale ranging from ‘never’ to ‘all the time’. The study population consisted of a convenience sample of 390 adults aged 18 years and older who were recruited in person by the authors in public common areas of university facilities (eg, cafeterias) using walk-up tables. Monetary incentives were not provided to participants. A study response rate could not be calculated due to the data collection methods. Data analysis proceeded in five steps. During step 1, we examined univariate response distributions for each of the 24-scale items. A simple correlation matrix was examined to identify redundant items. Finally, we assessed content validity based on agreement with the statement ‘I try to be a stoic.’ As a result of step 1 analyses, six items were dropped from further analyses—including the entire stoic composure domain. Further details of this scale reduction step are included in the Technical Supplement (online supplementary table 2). During step 2, we conducted a CFA of the reduced 18-item PW-SIS. CFA is the appropriate analytic choice to test scales that have an a priori, theoretically explicit subdomain structure.32–36 We used proc calis in SAS V.9.4 for the CFA. Based on the results of the first CFA, we eliminated two items with poor factor loadings (see online supplementary file 1, Technical Supplement, for details). During step 3, we repeated the CFA on the reduced 16-item PW-SIS. Finally, for the purpose of parsimony we further reduced the total number of scale items to 12 (3 items in each of 4 domains) and conducted a CFA on the final 12-item version of the PW-SIS (step 4; see online supplementary table 3). Additional details and rationale for analytic steps 1–4 are included in online supplementary tables 1–3: Technical Supplement. Step 5 of our analysis consisted of preliminary content validation, examination of response distributions for the overall and domain scores, and exploratory logistic regression modelling of sociodemographic predictors of strong endorsement of stoicism. For the logistic regression analysis, we categorised the outcome using the top quartile of the overall distribution of responses to represent strong endorsement of stoicism. The size of our study population (n=390) provided more than 15 respondents for each question in the preliminary scale, which exceeds the widely accepted norm of at least 10 respondents per question.37 Although skewed towards younger adults (78% of respondents were <25 years old), the study population was in other respects diverse (table 2). A majority self-identified as female (57%) and white (55%). Hispanics (15%) and Blacks (14%) were the second and third largest racial/ethnic groups, followed by Asians (9%) and biracial or other ethnicity (6%). A substantial minority of respondents (19%) were born outside the USA or Puerto Rico. The final four-domain, 12-item PW-SIS is shown in table 3. CFA of the final scale showed very good model fit with individual item factor loadings ranging from 0.48 to 0.76, root mean square error of approximation (RMSEA) =0.05 (95% CI 0.04 to 0.07), goodness-of-fit index=0.96 and Tucker-Lewis Index=0.93. Relationships among the PW-SIS and its four conceptual domains are shown in table 4. Cronbach’s alpha ranged from 0.64 to 0.71 for the subscales and was 0.78 for the 12-item PW-SIS. 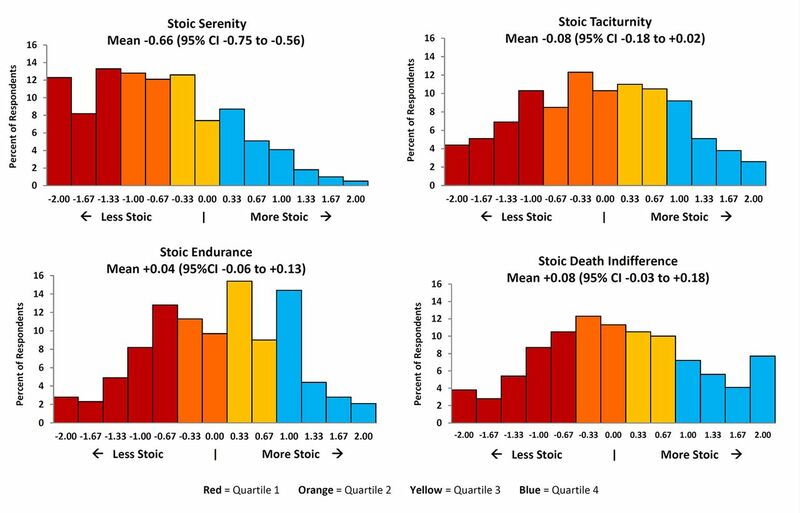 Scores for stoic taciturnity were strongly correlated with scores for both stoic endurance and stoic serenity, but stoic endurance and stoic serenity were not highly correlated with each other. Stoic death indifference had the highest (most stoic) mean scores among the four domains, and it was least correlated with the other three domains. 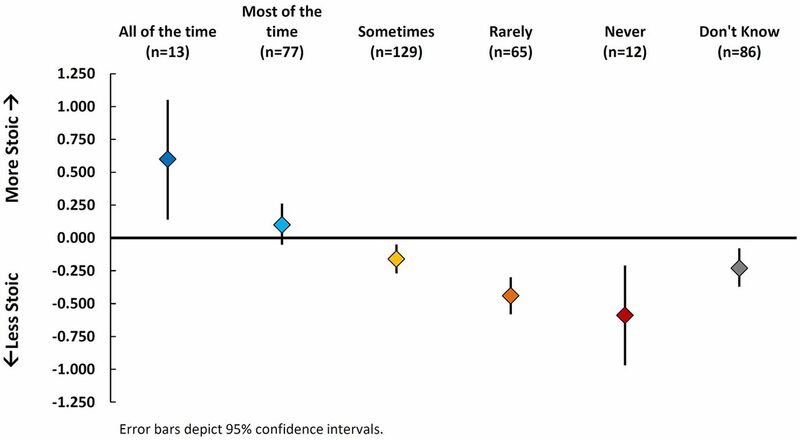 Figure 1 depicts mean PW-SIS scores by response to the statement ‘I try to be a stoic.’ There was a clear monotonic and statistically significant trend, with respondents who reported trying to be a stoic ‘all of the time’ having the highest stoicism scores, and respondents who reported trying to be a stoic ‘never’ having the lowest stoicism scores. Most respondents chose one of the three intermediate categories. Respondents who chose ‘I don’t know’ as their response had stoicism scores similar to those who said they ‘sometimes’ tried to be a stoic. The distributions of mean scores for the four conceptual domain subscales are shown in figure 2. Domain scores comprised the mean score for the three questions in the domain. In this study population, respondents were least likely to endorse stoic serenity and most likely to endorse stoic death indifference. Pathak-Wieten Stoicism Ideology Scale: distribution of domain scores. The full distribution of respondent scores is shown separately for women and men in figure 3. The distributions overlapped almost completely, but there were no men with the least stoic scores, and no women with the most stoic scores. 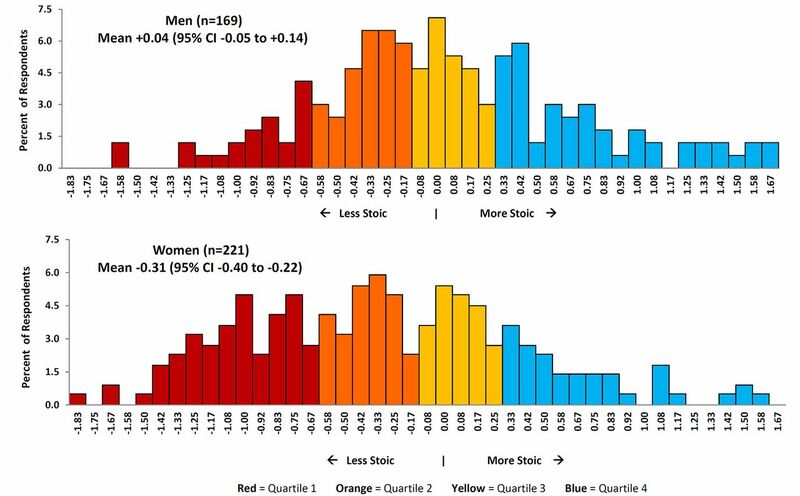 Response distributions were skewed to the left for women (less stoic) and to the right for men (more stoic), consistent with a statistically significant difference in the mean scores for women (−0.31, 95% CI −0.40 to −0.22) and men (+0.04, 95% CI −0.05 to +0.14). Pathak-Wieten Stoicism Ideology Scale: distribution of overall scores by gender. Results of an exploratory analysis of sociodemographic predictors of high endorsement of stoicism are shown in table 5. There is no a priori cut point designated as ‘highly stoic’ in the PW-SIS; in this analysis, the cut point used was a mean score greater than the 75th percentile of the overall response distribution. The top quartile of the distribution of all respondents (n=390) ranged from +0.33 to +1.67. Among women, 18.9% strongly endorsed stoicism, compared with 32.8% of men. After multivariate adjustment, men were over two times as likely as women to fall into the top quartile of responses (OR=2.30, 95% CI 1.44 to 3.68, P<0.001). Adults born in the USA or Puerto Rico were also twice as likely as adults born elsewhere to strongly endorse stoicism (OR=1.97, 95% CI 1.01 to 3.84, P=0.048). ORs showing stronger endorsement of stoicism by Hispanics, Blacks, biracial persons and adults 25 years and older were not statistically significant. The PW-SIS is a theoretically coherent, multidimensional scale which demonstrates good psychometric properties and content validity based on initial validation in a large sample of educated adults. The PW-SIS is also brief and practical for integration into a wide range of empirical research studies. In our study population of mostly younger adults, endorsement of stoicism varied by conceptual domain, with the weakest endorsement of the classical domain stoic serenity (aversion to strong emotions). Exploratory logistic regression analysis identified male gender and US birth as significant predictors of strong endorsement of stoicism. Finally, point estimates suggested higher endorsement of stoicism for Blacks, Hispanics and biracial persons compared with Whites, but these results were not statistically significant. Integration of our theory of a stoic ideology of the self into existing health behaviour models could help explain the formation of beliefs and attitudes towards criterion-specific help-seeking behaviours. Reasoned action approaches—such as the integrative model of behaviour prediction—poorly define background factors that underlie belief formation.38 Measurement of self-concepts, such as stoicism ideologies, may help explain this population variability. Expanding health behaviour theory to include aspects of the self could also help inform health education messaging and risk-based communication. In any questionnaire-based scale, validity of the individual items and the total scale against the concept of interest is of paramount concern. Unlike many psychometric instruments, the PW-SIS does not purport to measure a latent, inherent trait such as personality, or a clinically definable disorder such as depression or anxiety. Rather, we attempt to measure an explicit set of beliefs, which by definition are neither inborn nor immutable. Therefore, a robust assessment of the content validity of our scale items must come after publication and evaluation by multiple experts and researchers. We included a single questionnaire item ‘I try to be a stoic’ to assess content validity, but future validation and outcome studies could expand on this approach or include a qualitative component. A related question pertains to the predictive validity of the PW-SIS. In other words, to what extent does strong endorsement of stoic ideology predict actual stoic behaviours? Predictive validity can only be rigorously addressed through prospective study designs. Our study population, similar to many scale validation studies, was university based. Therefore, validity and generalisability to very different populations should not be assumed, but instead tested in future studies. In particular, validation of the PW-SIS among the elderly and persons of lower educational attainment would be valuable for health-related research. Our scale has several strengths. First, all items refer explicitly to the respondent; there are no aphorisms or proverbs. Second, each item refers to an expectation or belief about ideal self-conduct, rather than to a simple description of past behaviour. So, for example, Q5 states ‘I expect myself to manage my physical discomfort without complaining’ rather than ‘I always manage my physical discomfort without complaining.’ This distinction is critical to the theoretical underpinnings of the scale. Third, we deliberately chose not to mention disease or illness in the scale items, so that the scale would be appropriate for a wide range of study populations, including currently healthy individuals. (Although some items do explicitly mention ‘physical pain’ and ‘everyday aches and pains’.) Our intention was to capture the respondents’ global endorsement of stoicism as a code of ideal conduct. Finally, the PW-SIS does not reference gender norms, so it can serve as a tool to empirically investigate gender differences in stoic ideology. The PW-SIS should be validated in multiple study populations with a range of socioeconomic and demographic characteristics. Our theory that ideologies of stoicism will result in constraints on health-related behaviours needs to be empirically tested, ideally in rigorously designed prospective studies. Given the rise of patient-centred healthcare,40 41 understanding patients’ motivations and perspectives has never been more important. The current health education paradigm holds that improving patients’ knowledge of symptoms and signs will result in more timely help-seeking behaviour.38 42–44 Each year, thousands of individuals suffer needlessly and many die because of extended delays in seeking professional aid for acute medical conditions (eg, myocardial infarctions, strokes, diabetic emergencies, cancer complications and pain, and acute exacerbations of congestive heart failure).45–52 Numerous studies have been conducted to attempt to elucidate the reasons behind patient delays,46–51 53 with the ultimate goal of designing education programmes and interventions that will result in timely help-seeking. Significant risk factors for help-seeking reluctance have been identified (eg, Black race52 54 55) but much of the variation remains unexplained and we still lack a complete understanding of why certain patients and not others delay seeking aid. A distinction of our theory is movement of the focus of inquiry away from the disease and the patient’s relationship to the disease (eg, health knowledge, symptom awareness, ability to comply with self-care regimens) and onto patients’ sense of self—their self-concepts and self-identity.56 We hypothesise that illness behaviours may become ‘noncompliant’ or ‘irrational’ or ‘self-harming’ when specific courses of action would create an internal conflict with patients’ ideas of who they are. Specifically, we posit that people who strongly believe that they should manage their problems on their own, not show emotions, and not complain about physical discomfort will experience an internal cognitive conflict when faced with a situation that could require help from others. This internal conflict will lead to delays in or avoidance of help seeking, with potentially life-threatening consequences. For example, empirical studies of increasing rates of male suicide in rural Australia have identified hegemonic masculine norms of stoicism as an important causal factor in the context of severe economic stress.57 58 Understanding the influences of race, ethnicity, socioeconomic status, religion and other cultural factors on stoic ideologies may help explain past research findings on delays in help seeking. Finally, there may also be positive health consequences of stoic ideologies for individuals,15 which careful prospective research could confirm. The authors are grateful to the respondents for their voluntary participation in this study. We would particularly like to thank the four peer reviewers of this manuscript, whose detailed and thoughtful readings resulted in a substantially improved final paper. Epictetus. Enchiridion. Long G, translator. New York: Dover Publications, 2004.
. Meditations. Long G, translator. New York: Dover Publications, 2004.
. Stoicism. In: Zalta EN, ed. The Stanford Encyclopedia of Philosophy. Winter 2010 edn. Palo Alto CA: Stanford University, 2010.
. Maori experiences and perceptions of gout and its treatment: a kaupapa Maori qualitative study. J Prim Health Care 2013;5:214–22.
. Warrior Resilience Training in Operation Iraqi Freedom: combining rational emotive behavior therapy, resiliency, and positive psychology. US Army Med Dep J 2008:32–8.
. Can attitudes of stoicism and cautiousness explain observed age-related variation in levels of self-rated pain mood disturbance and functional interference in chronic pain patients?. Eur J Pain 2006;10:399–407.
. Liverpool Stoicism Scale Adaptation. Baltic Journal of Psychology 2005;6:57–64.
. Evaluating the Use of Exploratory Factor Analysis in Psychological Research. Psychological Methods 1999;4:272–99.
. Using Multivariate Statistics. Boston: Allyn and Bacon, 2001.
, eds. Health Behavior: Theory, Research, and Practice. 5th edn. San Francisco: Jossey-Bass, 2015.
. The big dry: the link between rural masculinities and poor health outcomes for farming men. J Sociol 2008;44:133–47. Contributors EBP conceived the study. EBP and SW developed the preliminary PW-SIS. All authors enrolled participants and collected questionnaire data. CWW contributed statistical expertise to the confirmatory factor analysis. EBP analysed the data. All authors interpreted the results and outlined the paper. EBP drafted the manuscript. All authors contributed to literature review and substantive revisions of the paper. Ethics approval Institutional Review Board of the University of South Florida.